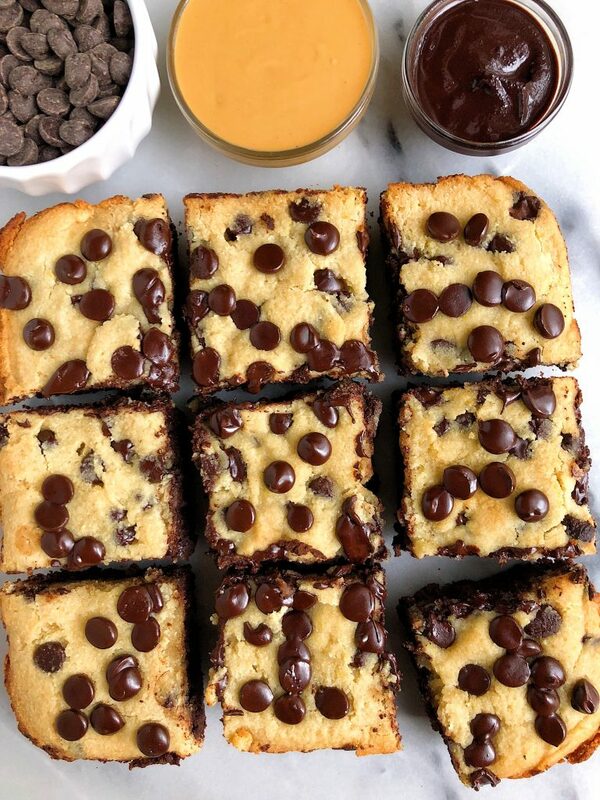 Gluten-free Chocolate Chip Cookie Brownies made with dairy-free ingredients for an easy and healthier “brookie” recipe. A personal favorite of mine! I first had a “brookie” when I was in college. For those of you scratching your head questioning what that even means, not to worry – it is a funny name for a brownie and cookie layered bar. 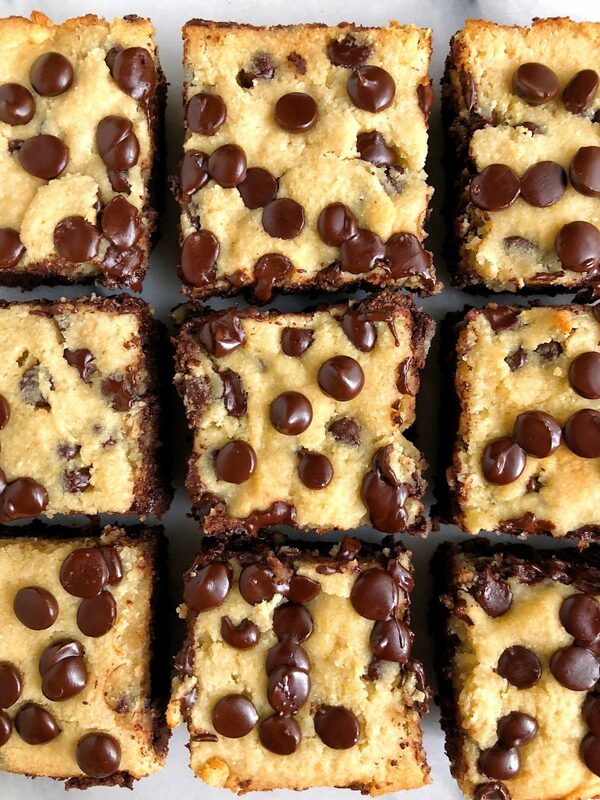 Think fudgey brownie bottom layer topped with a chocolate chip cookie. It is a double whammy of straight up dessert heaven. To be honest I am surprised it took me this long to share a homemade brownie cookie recipe but these Gluten-free Chocolate Chip Cookie Brownies were well worth the wait. I knew I wanted to make them as delicious and easy to make as possible. Thinking about making a brownie cookie bar also just makes me think of a recipe with double the clean up, but these are so simple and I promise your kitchen won’t look like a bomb went off when you pop these in the oven. The bottom brownie layer is made with pasture-raised eggs (or you can sub flax egg! ), coconut oil, unsweetened applesauce, almond flour and cacao powder. Plus a melted bowl of dark chocolate chips that make the brownies extra rich and flavorful. 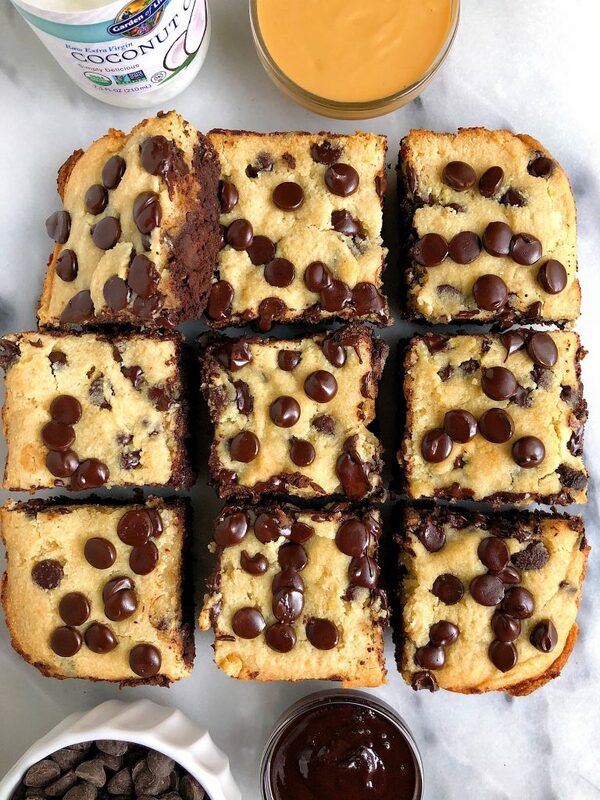 Then the top cookie dough layer uses almond flour, coconut flour, egg, coconut oil and some delicious dark chocolate chips that oh so perfectly melt right on top. For the coconut oil in this recipe, I use Garden of Life’s Organic Extra Virgin Coconut Oil. This is one of my biggest pantry staples. I use it for so many recipes and also keep extra jars in my bathroom and bedroom for non-baking related things. I love that you can melt the coconut oil in the microwave so easily to get it to liquid form (what we do here) then just wait a couple minutes for it to cool before baking with. If you decided to sub flax egg for the pasture-raised eggs in this recipe, you can also use Garden of Life’s flaxseeds in there to make a flax egg. Either way these Gluten-free Chocolate Chip Cookie Brownies will be delicious! If you are in the mood to bake a few different things today, here are a few of my other go-to recipes with Garden of Life products: Homemade Paleo Seed Bread, Paleo Golden Cinnamon Rolls, 6-ingredient Vegan Chocolate Scones and Fluffy Vegan Pancakes. Allow the bars to cool completely then slice and enjoy! Thank you Garden of Life for sponsoring this post. It means so much to me to partner with brands I love and believe in! hi! is the cookie part supposed to be 1 1/3 cup or 1/3 cup of almond flour? I see the baking powder in both sets of ingredients yet only the cookie layer instructions mention the use of baking powder! Should I still add it to my finished brownie batter?